By placing an order with Rocket Signs, you must agree to the following terms of sale. If you have any questions about these terms, please contact us prior to ordering. WEB SITE ACCURACY: The prices and information on this web site is deemed to be accurate at the time it was posted. Mistakes do happen. If you are ever unsure about a price or information, please contact us to confirm it. Rocket Signs apologizes for any error in price or information for which can not be honored. TURN-AROUND / PRODUCTION TIME: Rocket Signs has a remarkable turnaround time ranging from same day up to a week most commonly. Please ask your sales rep for a clearer picture of when your order will be ready if you are expecting your order by a certain date. All orders that are packed and ready to ship by the shipping carrier's cut-off time, will be shipped regardless of when they were ordered. To ensure your order ships the same day, we have designated a cut-off time of our own. If you place your order, approve your design proof and square away payment by the cut-off time, your order will ship out the same day. The cut-off time is 11am Eastern time, Monday through Thursday only. Orders placed after the cut-off time or for orders placed on Friday, should ship out the following business day. Product descriptions will specify whether or not same-day turnaround is available. Not all items can ship the same day. Same-day service many be suspended on national holidays, as well as other days of the week when there is a national holiday, inclement weather, acts of God, illness, power outage, equipment failure, unusually high volume, labor strike or other events beyond our control. While same day turnaround is the norm, it is not a guarantee. The only way to have your order guaranteed to ship on or by a specific date is to request a "deadline guarantee certificate number" when you get ready to order. RUSH JOBS & RUSH CHARGES: The industry standard of charging an exorbitant fee for working a little harder and faster to meet your deadline is something Rocket Signs doesn't do. Rocket Signs has a reputation for working longer days during busy periods to get orders done on time. That's one of the many differences that lead people to choose Rocket Signs. However in some cases, when a rush is requested during an exceptionally busy period, mistakes or quality defects may occur. By requiring Rocket Signs to rush the job, you must also accept any minor mistakes or quality defects as a result of rushing it, without any remedy. "NO EXCUSES" ON TIME OR YOUR MONEY BACK GUARANTEE: The standard turnaround time for most products ordered through the website is a matter of hours, which is unheard of in the industry. However, the only way to have your order guaranteed to ship on or by a specific date is to request a "deadline guarantee certificate number" when you get ready to order. You must receive the "deadline guarantee certificate number" in writing from the sales department. You can ask for one prior to ordering either online or by phone. You will then be sent a confirmation that your order will be shipped in time to be received by your deadline. If it isn't shipped by that time, you will get a refund. Orders backed up with a deadline guarantee certificate number will be followed closely from beginning to end to ensure they ship out in time to get to you by your deadline. There is no extra charge to have your order guaranteed. If you are promised that you will have your order by a specific date and it doesn't ship out in time for you to receive it by that date, Rocket Signs will refund your money for the items you can't use. To be eligible for a complete refund, all of the items must be returned to us in new, unused condition within 7 days. To do this, please contact customer service and arrangements will be made to pick up the order at our expense. Not all orders can be guaranteed. Delays that occur during shipping, including, but not limited to, weather delays, labor strikes, remote addresses and unusually high volume, are beyond our control and therefore we do not guarantee the order will be received by a certain date, only that the order will be shipped by a certain date using a day-definite and reliable shipping service. We reserve the right to upgrade you to a faster shipping method at our expense, if necessary. EXTRA CHARGES & FEES: Unless otherwise stated, expect the prices to be "all-inclusive" and will arrive at your door at that price, ready to use. The only extra charge that may be a concern is sales tax. If an order is being exported, you will be responsible for all duties and tariffs when it enters your country. FREE SHIPPING OFFER: Rocket Signs does not charge freight, shipping, or handling for the lower 48 United States on custom sign products for a single address for orders of $99 or more. 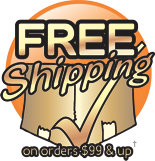 The free shipping is usually Fedex or UPS Ground, or the least expensive day-definite carrier or service. If you require a faster service, such as overnight or second day shipping you can upgrade for an additional, but discounted charge. ﻿ If your order needs to be shipped to multiple addresses, the shipping for one address will be free but the shipping charges for the other addresses will not be free. Furthermore, there may be an extra cost for additional packaging for multiple addresses. The free shipping offer may exclude stock signs and supplies like stands ordered independently without any custom products. The offer also excludes delivery to addresses not serviced by the major shipping carriers that we use or addresses in geographically remote locations with significantly higher than average shipping costs. The offer may also exclude shipping on large oversized shipments. Items that are ineligible for the free shipping offer will clearly say so in the product description in the online store section of our website or you will be notified prior to processing your order if additional charges will result due to your address or items ordered. At our option, for orders consisting of numous parcels or large sizes or weights, the free shipping method may be delivered by a freight line in a "big rig." OVERRUNS & UNDERRUNS: In many cases, it is not possible to fill the quantity ordered completely due to many factors. Orders for printed items of larger quantities are subject to having an underrun of up to 3%.﻿ In the event of an underrun, you will be credited back for any shortage. In the event of an overrun, you may be shipped a little more than the quantity ordered. You will not be charged for any overrun either however any accessories that may have accompanied the order, such as wire stakes, will still be shipped in the original quantity ordered. Underruns will be indicated on your invoice or sales receipt provided with your order or separately after the order is complete. If you find a shortage that is Rocket Signs was not aware of, report it within 7 days of receipt of the shipment so an investigation can take place and replacement or credit can be issued if necessary. FREE DESIGN SERVICE: Rocket Signs offers free design for prospective customers. This service has it's own separate terms and conditions that can be found elsewhere on this site. By using this service, you must agree to those terms and conditions. content and proofing is the customer's responsibility. Once the proof is approved, last minute changes made after approval are not guaranteed and may not be possible. subsidiaries and vendors from any suit, claim or demand arising from the reproduction or use of the material you provided to us. Artwork supplied to Rocket Signs that contains intricate details, very small text or other elements that, due to our printing limitations, cannot be printed, may be visible on a proof, but will not be present on the actual printed item or it may be present with some defect. It is the responsibility of the customer to verify whether such details on supplied artwork are likely to be omitted or have print defects as a result of printing limitations. No guarantee is made that intricate details or small text in supplied artwork can be printed or printed without defects, even if the details show up on a proof and Rocket Signs is not responsible for omissions of copy, content or elements of supplied artwork that are beyond our capability to reproduce or reproduce within reasonable quality standards. COLOR MATCHING: Although color matching is offered as a service, because of many factors beyond our control, Rocket Signs does not guarantee exact color matches on any products. Furthermore, the colors displayed in proofs and on this web site are not intended to represent the actual colors of the actual finished printed goods. Numerous factors and limitations in online displays prevent us from displaying the exact color of the finished product. PAYMENT: Unless an open account has been established, Rocket Signs requires 100% full advance payment before the production will begin. Purchase orders can also be used in conjuntion with an open account which can also be used upon acceptance of a signed credit application. You can pay with any of these major credit cards: Visa, MasterCard, Discover Card or American Express. Debit and cash cards with any of the major credit card logos that we accept are also accepted. You can also pay with a personal or company check by faxing or emailing the check. You do not need to mail the original. The check is processed like a regular check, although when you receive your canceled checks, you will have a different looking bank draft for this transaction. Prepayments made by check will have to clear the bank before production will begin. For this reason, we recommend setting up an open account or using a credit or debit card. C.O.D. 's or cash on delivery is available for an extra cost and requires an open account. RETURNED CHECKS: There is a $45 fee for checks returned regardless of the reason. CREDIT ACCOUNTS: Rocket Signs offers open account terms if you are a customer that orders regularly and are creditworthy as determined by credit reports and/or credit references. Credit accounts may have additional terms and conditions. Please ask a sales consultant for an application if you are interested. RETURNS & CANCELLATIONS: Rocket Signs stands behind all work 100%. If there is ever anything that is keeping you from loving what you got, please let Rocket Signs know so that any problem can be fixed. Because custom products are not restockable or reusable, it is not customary to issue refunds. Repair, or replacement on defective material or problems with workmanship is offered instead. If for any reason you are unhappy with a stock item, such as accessories or stock signs that haven't been customized, you can return those products for a complete refund minus shipping if returned within 15 days. Return shipping will be paid by Rocket Signs only in the case of defective merchandise. All returns require an "return authorization number" from customer service and all returns must be received within 15 days of being issued a return authorization number. Please notify Rocket Signs with problems with your order within a reasonable amount of time to ensure prompt handling. Within 5 days from delivery is best. MISTAKES: Rocket Signs is operated by human beings and as a result, mistakes with orders do occasionally happen that are entirely our fault. While we will do everything in our power to correct the mistake and do your order over again if necessary, you must agree to release Rocket Signs from any liability resulting in damages resutling from your inability to use the order resulting from a mistake that was made on our behalf. For that reason, we highly recommend ordering far enough in advance so that a replacement order can be sent to you ahead of any deadline you may have. ORDERS DAMAGED OR LOST IN TRANSIT: If you received a damaged order, please point out the damage to the delivery personnel if possible. If this is not possible, retain all packaging and packaging material as well as the damaged merchandise. Notify us within 3 days of receipt. We will submit a claim for the damage with the shipping company who will conduct their own investigation and take posession of the damaged merchandise. There may be a period of time of up to 60 days before a refund can be issued. In some cases, we may, at our discretion, bypass the claims process and send a replacement order. UNCLAIMED ORDERS: Unpaid orders that have been placed that have not had their design proof approved within 7 days will be voided. Prepaid orders that have been placed that have not had their design proof approved within 90 days will be voided. If payment was made, we reserve the right to retain all monies. Orders that have not provided a shipping address or that were supposed to be picked up will be stored for a maximum of 90 days. After which time, the order will be treated as unclaimed lost property in accordance with the laws of our state. WARRANTIES: Except where expressly stated, no warranty is offered or implied.